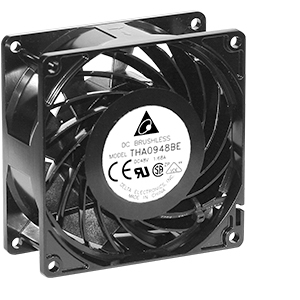 Designed for high performance to cover 2 fans in serial, the THA Series fans produce less vibration than similar fans. In addition to rotor blades, the THA has stationary blades to regulate high density air flow. THA includes a finger guard and a die-cast aluminum frame. This standard DC axial fan has Delta’s highly reliable ball bearing system that is ideal for telecom and other industry applications.